Days after the House voted to repeal and replace the Affordable Care Act, Barack Obama called on Congress to show "courage" in the ongoing health care debate. 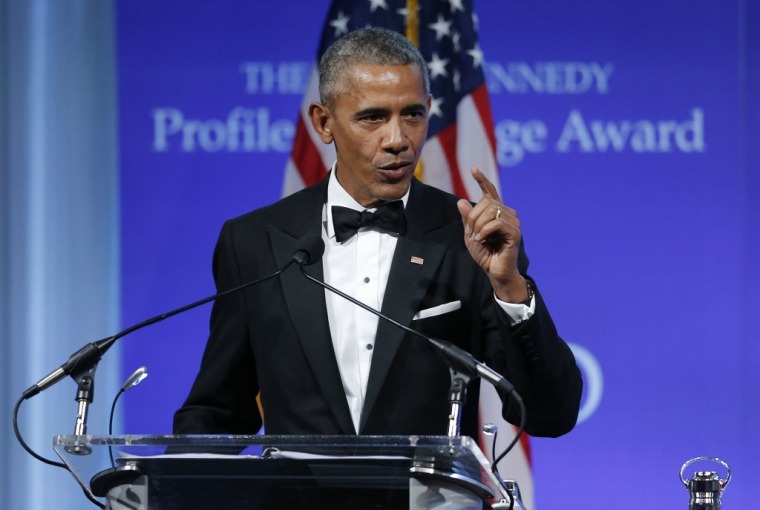 Speaking to an audience at Boston's Kennedy Library, where he was accepting the Profile in Courage Award, Obama noted the political risks taken by members of Congress who voted for the ACA. "It is my fervent hope, and the hope of millions that, regardless of party, such courage is still possible," he said. "I hope that current members of Congress recognize it takes little courage to aid those who are already powerful, already comfortable, already influential — but it takes great courage to champion the vulnerable and the sick and the infirm," he continued. “I hope they understand that courage means not simply doing what’s politically expedient, but doing what, deep in our hearts, we know is right." While he acknowledged the partisan division on the issue, Obama also issued a call of unity. "Everywhere, we see the risk of falling into the refuge of tribe, and anger at those who don't look like us or have the same surnames, or pray like we do," he said. "At such moments, we need courage to stand up to hate, not just in others, but in ourselves." Watch Obama's Profile in Courage Award acceptance speech below.